This garden is sponsored by the Sope Creek Garden Club and is designed to display native perennials which are good nectar sources. The garden was given a stacked rail fence to serve as a boundary to visitors who want to observe the bee hive. The hives are maintained by Jim Ovbey and Cindy Bee of the Metro Atlanta Beekeeper's Association. The garden is designed to maintain a free flyway from the front of the hive to the the adjacent pasture. Planting areas are to the right, left and behind the hive. As you walk through the park you should see bees gathering nectar (carbohydrate) and pollen (protein) from the blossoms of plants and trees. They are also gathering water and visiting the trees where they collect sticky substances (propolis). The nectar and pollen are their primary foods. The water is used for their “air conditioning system,” and the propolis, meaning “for the house,” is used to varnish the inside of the hive, seal the cracks and “glue” the various parts to form a strong structure. There are probably about 40,000 bees in this beehive. The adult bees forage as far away as 10 Kilometers and must make as many as 75 such trips to produce even a gram of honey. The work of foraging for the colony is so demanding that the bees die after about three weeks of this strenuous activity. The Sope Creek Garden Club meets at Eastminster Presbyterian Church, Sewell Mill and Canton Roads. For more information about this East Cobb club, you can or go to the Club's web pages. Click on this photo to see a part of the bee yard. What is the major benefit we derive from bees? How many flowers must bees visit in order to produce one pound of honey? What "farmer" produces food only for himself - yet without him, the world's food supply would suffer, and some foods would become extinct? 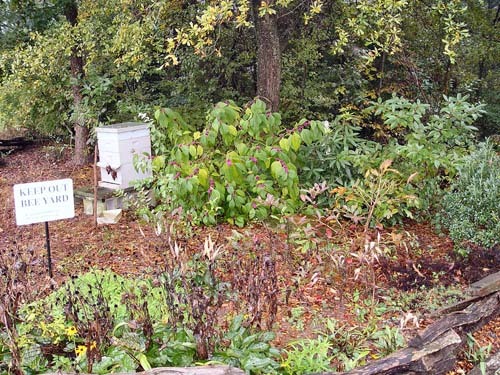 The hives are maintained by Jim Ovbey and Cindy Bee, members of the North Metro Beekeepers’ Assoc. Return to Sope Creek Home Page Return to Froghaven The split rail fence has been built out behind the hive and additional native shrubs have been planted, including Nine Bark and Alabama Snowwreath, both of which are rare in nature due to habitat loss.